Inside the Tao, we are met with the basis of human activity: greed, ego, partnership and community. As we walk this strange path and are thrown down whatever road the Tao directs us, we find that cooperation with ourselves and others is the only way forward. Watch as four characters struggle to decipher what is real and what is simply a warped perception of reality. Our own experiences can make it so hard to let go; but the Tao forces us to make connections. If we work together, the unpredictable and unattainable somehow begins to become possible. Choreography & Direction: Angela Buccini Butch in collaboration with cast, with workshopped material by members of ABCirque & The Muse. Based on Steve Reich's modern minimalist masterwork, "Different Trains" is performed with live musicians, featuring acrobatic choreography by ABCirque. In three movements, company members of ABCirque, will depict the ups and downs of a family before, during, and after WWII. Reich wrote Different Trains while contemplating his childhood train trips in the 1940’s between New York and Los Angeles. As a Jewish man, it occurred to him that similar train trips in Europe during that time had a very different and haunting implication. Blending circus and dance, German wheel and aerial choreography, Different Trains forges an emotional connection through the narrative, while also striking an emotional chord inline with the music's story and inspiration. Check out a review of the most recent "Different Trains" in The New Yorker! Imagine you are a part of a circus ballet, with aerialists and acrobats, human puppets and performers on silks swirling around you, all choreographed to Stravinsky's wild, surreal, virtuosic, energy - filled Petroushka. In this show, massivemuse, ABCirque and the Experiential Orchestra combine forces to produce Petroushka live with circus choreography where the ballet is performed by ABCirque performers. Choreographed and directed by artistic director Angela Buccinni. Conducted by Experiential Orchestra Music Director James Blachly. A Cowboy, A Pretty Lady and a Gentleman play with ropes, whips & knives ....in Brooklyn! Mosey on over to The Muse as it converts to a western saloon for an evening of thrills! 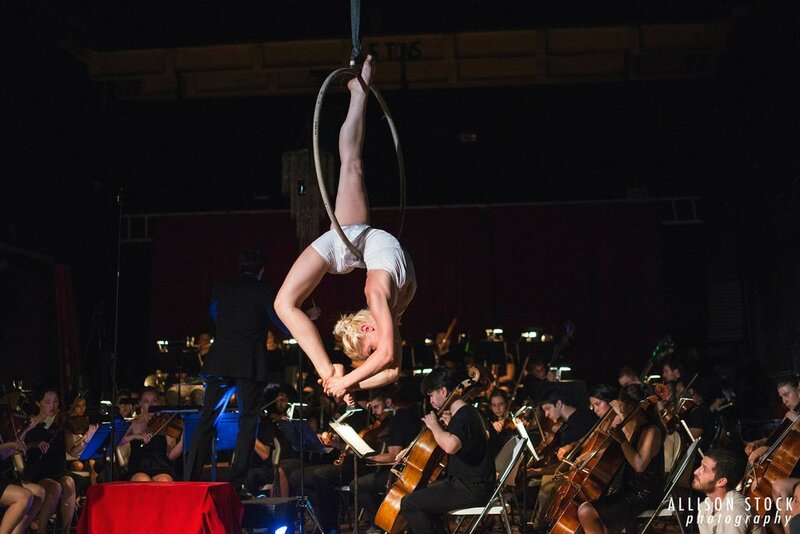 An Experiential Orchestra in collaboration with GroupMuse & ABCirque at The Muse Brooklyn. Drink your cares away as you enter into a bohème of an opium den on a psychedelic journey that only the combination of circus and symphony music can create. GroupMuse & ABCirque go BIG with a symphony spectacular that tells the tale of a young artist's self - destructive play and passion for a beautiful woman. You will witness his obsession, hallucinations, tantrums, moments of tenderness, ecstasy and despair. After years of touring and collaborating together the master mind Richard Grimes of Cordis & circus choreographer and director Angela Buccinni of The Muse Brooklyn & ABCirque have decided to bring the concert home to Brooklyn! Cordis is a progressive rock chamber music group. Known for their ambient textures, prominent use of electric cimbalom, and extensive percussion. For their home concert ABCirque & Cordis will break the 4th wall of the traditional concert setting with innovative, genre-breaking circus choreography of Buccinni & her company as they emerge from all angles of the warehouse. Without traditional seating as you enter the massive warehouse, brace yourself for a musical & thrilling visuals like never before. While we often reminisce about the Big Top days, the touring circus, the lions and tigers and bears (oh my) -- Justice Avengers busts that aesthetic wide open. This show defies expectations, destroys gender and social norms, and gets in more than a few good jabs at our horror-show president. 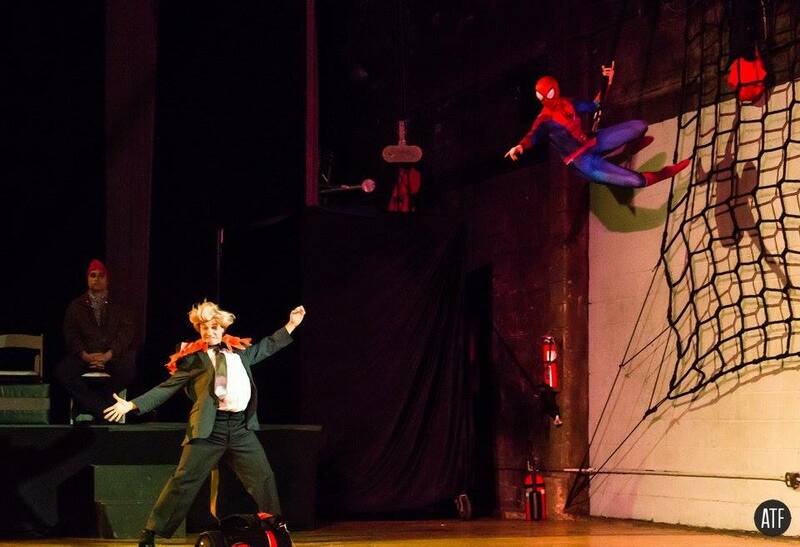 Justice Avengers is an interactive show that confronts real-life injustices and challenges its audience to work together to solve problems -- with a little help from a cast of gravity-defying superheroes. But this show is as risqué as it is subversive. All of our superheroes are just a little bit off -- not manly enough, straight enough, American enough. It celebrates difference in true circus style -- by dressing it up in spandex, handing it a microphone, and embracing whatever happens next. Imagined, designed, and co-created by a team of NYC’s best acrobats, dancers, and rigging experts, Justice Avengers is an immersive adventure and an opportunity to the outer limits of possibility. Mumbly Junk is both a creature and feeling that lives in a dark room with no windows. Through circus, song, dance and a few twists and turns the Mumbly Junk learns, grows, and finds friends and courage in the face of the unknown. Sign up with your email address to receive news and updates from The Muse Brooklyn and ABCirque!